With two showrooms, one in the King’s Road and the other in Mottingham, it can be inconvenient for some to travel over to Chelsea from the South East, and vice-versa, on a Sunday morning, to go for a ride. So what about organising an event that starts in both locations, and joins in the middle? Voila! The End-to-End Run - two groups riding from either end of the A272, meeting at a suitable hostelry approximately half way. If you have not been on a C&F H.O.G. Ride, you will not know how well organised they are - C&F H.O.G. prides itself on putting quality before quantity. Each route is ridden at least once by everyone involved in making it all work like clockwork on the day. That means the Ride Leader, the Last Man, and any Marshals that volunteer to help. Hopefully, this identifies any nasty surprises that may not be obvious from a map, such as road works, awful surface conditions, nasty traffic snarl-ups and so on. Everything that could go wrong is carefully considered, to ensure everyone has a great day. A dozen or so HOG’sters gathered outside the Mottingham showroom on a gloriously sunny Sunday morning listening to the briefing conducted by Ride Leader, Nick “General Patton” Page, a charismatic Englishman with a propensity for large cigars, a slightly American accent and a C&F H.O.G. Assistant Director. I had volunteered to be Last Man, and Dave Mollison, Marshal, for the day. ...success! The collective sigh of relief was palpable and could probably be heard over a dozen droning V-Twins. Off we set, through Chislehurst and Orpington, avoiding the M25 through Riverhead, and then a quick sprint down to Tunbridge Wells. After the inevitable traffic jam that is Southborough, we escaped from speed camera and traffic light hell and swooped serenely along the A267, past my favourite car showroom in Five Ashes, to pick up the start of the A272. At least now, we won’t get lost! If you cannot get a tunnel into your Harley ride, then the next best thing is a very narrow street with high walls either side. That rather accurately describes Petworth, an amazing ‘chocolate box’ town, full of tourists and very posh antique shops, surrounded by country estates with polo grounds. As you can imagine, a bunch of noisy Harley-Davidsons fitted in perfectly, as we thundered around the one way system. Almost to the second, we arrived at the Hamilton Arms in Stedham, bang on schedule, to find the King’s Road contingent safely installed, ordering some of the finest Thai cuisine you are likely to get outside Asia. 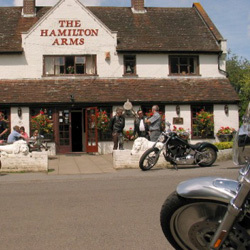 It never ceases to amaze me how people react to Harley-Davidson motorcycles, especially when there are twenty or more parked outside a village pub. A thoroughly superb lunch was had by all before we split into two separate groups for the journey home. Some chose to return the other way round the A272, if you see what I mean.